If you're currently in the midst of a winter freeze like me (will Chicago ever be free of snow? ), maybe this will warm you up. 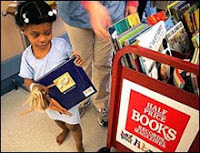 Every year since 1999, Half Price Books holds its Half Pint Library Book Drive, an effort that donates books to U.S. children in need. Last year, more than 104,000 books were given to the Half Pint Library program, with donations going to children in hospitals, schools and community outreach programs, among other institutions. So what can you donate? Any type of childrens book, including Spanish-language books, in good condition. Where and when can you drop books off? Now through March 31 at any Half Price Books location. Click here to find a store near you. Who says giving has to end in January?